10% discount is offered for annual payment of fees and 5% discount for termly payments made. At Hurly Curly we recognise that every young child is a unique gift. We pledge to nurture these gifts by providing a safe and stimulating environment where each child will delight in learning. Our goal is to generate positive relationships with peers and adults empowering emotional, social and academic growth. Our little jewel is hidden away in a beautiful Hurlingham Manor, between Sandton and Randburg, with 24 hour boomed security and easily accessible from Republic Rd. The school is small and intimate, like a home away from home. 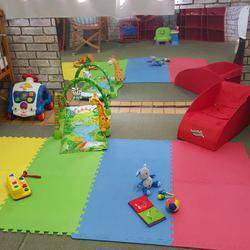 All classes have a teacher child ratio of 1:5 or below in order to offer individual attention to your little one. 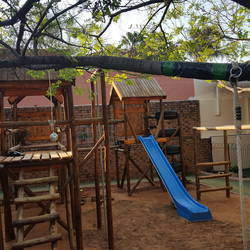 Our school is run with an CAPS curriculum enriched with additional activities. Through our planned curriculum and regular assessment we aim to identify any barriers to learning before they affects the childs learning ability. We are registered with the Dept of Health and Education as well as Dept of Social Development and South African Council of Educators who frequent inspect our premises and procedures as well as monitoring our staff in order to maintain the highest quality of education. However we do remain open for holiday care throughout the year, with the exception of public holidays and three weeks over the festive season. 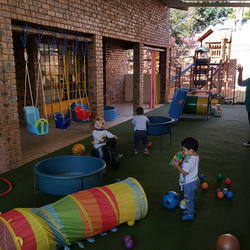 Holiday Care, packed with fun activities, is offered to children who do not attend Hurly Curly. Just register with us in advance to reserve your space. Children are given a nutritious, balanced diet that encourages a healthy diet and independent meal times. Our school proudly cares for children from the age of 6 weeks all the way through to 6 years where we prepare children for the high expectations of any Private or Public School you may intend sending your children to. We believe in an open door policy and encourage parents to view our school at their convenience. Please visit or call us with any questions or concerns you may have. Hurly Curly has taken the time to get to know my children and how they learn. We love the manners and respect that our kids have learnt along with an impressive selection of songs and general knowledge. Thank you to the staff for all you do!